Nix has spent her entire life aboard her father’s ship, sailing across the centuries, across the world, across myth and imagination. But the end to it all looms closer every day.Her father is obsessed with obtaining the one map, 1868 Honolulu, that could take him back to his lost love, Nix’s mother. Even though getting it—and going there—could erase Nix’s very existence.For the first time, Nix is entering unknown waters.She could find herself, find her family, find her own fantastical ability, her own epic love. As long as her father has a map for it, he can sail to any time, any place, real or imagined: nineteenth-century China, the land from One Thousand and One Nights, a mythic version of Africa. Along the way they have found crewmates and friends, and even a disarming thief who could come to mean much more to Nix. I have been hearing non-stop raving reviews of The Girl from Everywhere that when finally getting my hands on the copy of the book, I could not hold my excitement for when I could finally read it. The concept of the book was really what got me hooked and overall this was not my typical read but one I found myself enjoying. I just loved the idea of time travel. Heidi brought in magic, fantasy, and a ship and took me on an adventure. I do have to admit that there was a lot of parts where it was slow. There was a lot of world building going on but then where I felt things could pick up, it slowed down. I am not so sure how I feel about this but it wasn’t something that turned me away from reading. In a way it increased my interest and pushed me to the end. I really enjoyed Nix’s character. I felt she was a strong female character that other girls could find a connection to. She has a lot riding on her life with the fact that she could cease from existing if her father, otherwise known as the Captain, is successful in his mission. The idea of this mission keeps me on my toes. Kashmir seems like a dreamy guy. There were so many emotions going through my mind with him and I wanted him so much to happen and I am so looking forward to the next book to see where this relationship is. Heilig’s story is an amazing debut that will surely capture your heart and have you magically set sail on a book that will take you on an adventure and away from reality. 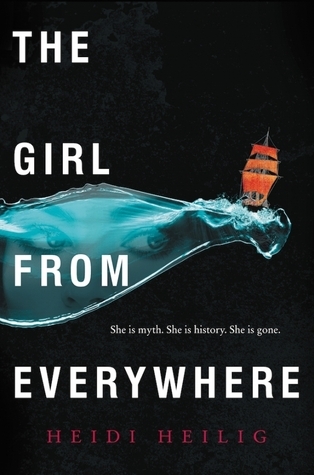 The Girl from Everywhere is a stunning beautifully written story that slows down and allows you to enjoy everything overall.